So, another round of playing the waiting game. Embassy doesn’t open until 3pm for people like me. This of course kills all chances of making it into China before the weekend and so I will be having more off days, which I really don’t want any more. Time is running short until the end of the year at any rate. But there was still this uncertainty about the visa. Got it - can leave the town - and can plan for the future. Which I did. Cleared a flight to Osh for tomorrow, hoping the weather is better there. And started planning for when I arrive and what needs to be done until then. All of this was followed by a good-bye dinner with Ainura and Tanja. Off I go to China … and eventually Miami. So, this would have been another day for which I would have posted a one-liner. But as I was sitting in an internet cafe, a hand is slapped on my right shoulder and without turning around I figured it was Bastien. Turns out it was him - but I didn’t see him smile. His bike was stolen (and another biker’s vehicle as well). Ouch, ouch, ouch. He has all his bags still, but the bike is a goner. If you happen to see a bike made by Fahrradmanufaktur in Bishkek, do what you can to stop it … never mind. So, without wheels and without a good bike store Bastien is pretty much stranded. The only idea I could come up with was to call Speedzone and they will see what they can do for him, if anything. Thanks for looking into this at least!!! There is no bike to be had here really, so shipping one in is the only option for the time being. Now, keep your fingers crossed that my bike is neither damaged (earthquake) or gone, though it was locked into a room when I left it in Sary-Tash. In other news, I can pick up my passport on Wednesday. From what I understand the visa has been approved and so I can move out and on. Will post the definite news once I have a hold of the passport. And though these pictures aren’t new, they may still be worth taking a look at. Nothing much happened … neither on Sunday nor on Monday. So I am again posting two days in one. Hung around, did some little errands here and there. Apart from that it is waiting out the long weekend in the US and for US the consulate to open again. 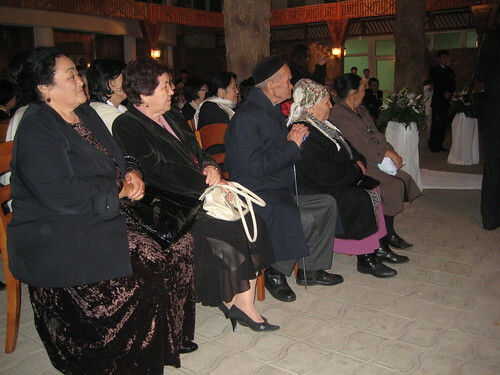 Hopefully with the missing number being in the system now so that I can leave Bishkek. The weather is starting to turn here it seems. Rain in Bishkek could mean snow where I need to go back to. Keep your fingers crossed as well for that not to happen. Another wedding on this trip - it is really quite remarkable. It seems that I am popping up when these things take place at the moment. 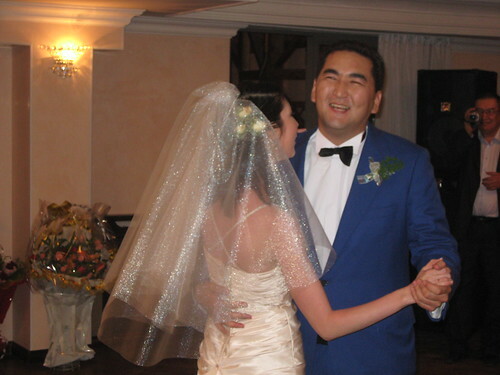 And it is always a lot of fun to be looking at how weddings are celebrated in different parts of the world. This one was no exception … well, sort of. It was about as traditional as it had to be I felt. 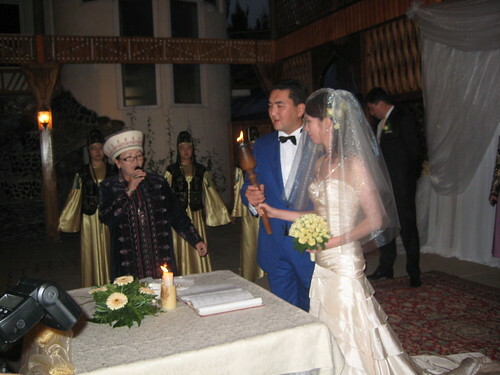 Nazar and his wife are rather modern in their world view and so their ceremony wasn’t big on the Kyrgyz motiv. 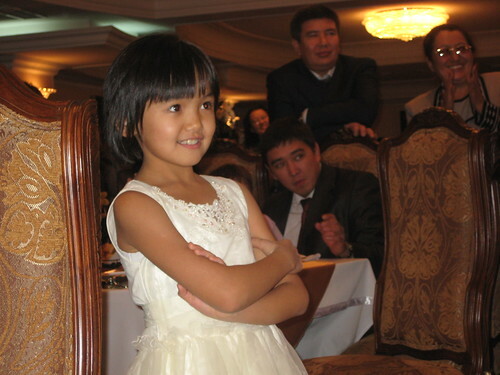 But it was a wonderful celebration nevertheless. and lots of good food. Another slow day … I meant to write solely: waiting and waiting. Which is really what I am doing here. 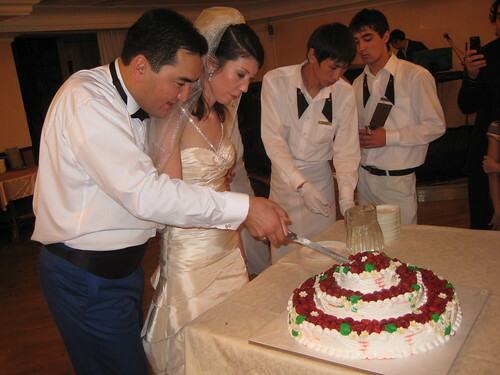 But the waiting game here allows me to be participating in the wedding of a friend of mine here in Bishkek. And yes, there will be pictures again. At night a group of us went out for dinner in a Lebanese restaurant here in Bishkek (unheard of a few years ago, the city has really developed in a lot of ways) and then headed for a club. Come to think of it, this was the first time out since Tirana / Albania. It was a lot of fun and the band was really good. Their singer had a great voice, the guitar player was amazing. Too bad their repertoire was somewhat limited. Don’t get me wrong, Pink Floyd’s “Another Brick in the Wall” is a good song, but when you hear it three times within a couple of hours … (this is not the band’s fault, really - the way it works is that members of the audience can select the songs and they pay for it; and that doesn’t always work out so well). A fun time at any rate.